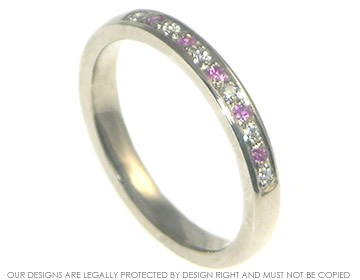 This sparkly half eternity ring incorporates pink sapphires and H SI diamonds with a traditional setting technique to add extra sparkle to a modern style ring. There are eleven brilliant cut stones alternating pink and white. It is a distinctive yet easy to wear piece that is 2.5mm wide and made of 18ct non rhodium plated white gold.